Blade length : 69.7 cm or 27.4 inches. Width at the hamachi : 3.22cm or 1.26 inches. Shape : This blade is wide and thick with little Sori. Kissaki is long. Jigane :Itame-hada well gained with jinie attached. We can see Hadame well. Hamon :Niedeki, Gonome-midare.KInsuji works. round Boshi. Special feature: Shige taka continued to several generation from the first geberation. Hamon is regular Gunome midare hamon with well grained Jignane. The blade is suriage and Machiokuri but healthy blade. Tsuba : patterns are engraved into round iron Tsuba. 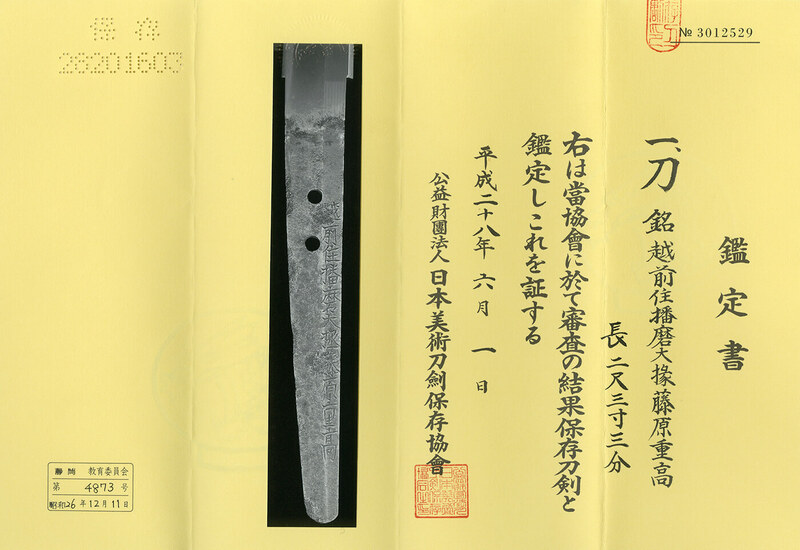 Menuki : Syakudo plate, a rod is carved.